So I was out of town a couple of weeks ago at a meeting of the Catholic Biblical Association. It’s an annual gathering of biblical scholars that I attend as an “associate” member—someone who isn’t really a scholar but who works with the Bible on a regular basis and who would benefit from hearing research reports from the full members. One of the things I enjoy about this gathering is the collegial atmosphere. For the most part, everyone is treated equally: the great, the near-great, and the just plain silly. You are not looked down upon if you don’t have a PhD; you are welcomed just as much as the most celebrated, published scholar. At the conference, I had the pleasure of sharing dinner with an old friend whom I hadn’t seen in a few years. Like the others, he is a respected scholar and researcher, but he is also a born teacher who brings a pastoral approach to his studies. Plus, he’s from Canada, so he has niceness encoded into his DNA. The last time we met, I had told him a little about our fourth child, whose high-functioning autism we were just learning about. This was our first diagnosis. We didn’t know about the others until later on. So it was only natural for him to ask me this time how our boy was doing and how the rest of the family was adjusting to his uniqueness. That’s when the discomfort began. Should I tell him that all six of our kids are on the spectrum? Do I have the emotional energy to give a minor tutorial in the ins and outs, the mysteries and challenges of ASD? I’ve been down this road before with a lot of other people, and I was getting tired of it. I debated changing the subject, but I respected this fellow too much to stay shallow. So I dove in, with a lump in my throat. As it turns out, I didn’t have to worry. My friend, along with a couple of others at our table, listened carefully and asked insightful questions. They showed genuine concern for our kids. They shared their own experiences and understandings of autism. We ended up talking together about how God is and is not at work in challenging situations like mine. So what began as a general “How’s it going” conversation grew into a shared reflection on mercy, grace, compassion, justice, and perseverance. It was as if we had formed an impromptu community of faith. Mind you, I did feel somewhat uncomfortable being the center of attention for so long. I was afraid that the conversation would decline to the kind of pity and mock-sympathy that I detest. But another part of me thoroughly enjoyed the conversation. There was something distinct about it. Everyone there was immersed in Scripture and its teachings, so our discussion had a strong faith dimension to it. Of course, not every Scripture scholar is a saint, but it was clear that these people had taken Jesus’ words to heart and were striving to live in the love of God. That’s no small thing. The Cloud and the Chip. Rather than feeling drained, as I usually do after “raising autism awareness,” I left the conversation feeling energized and encouraged. And that got me thinking. You see, I’m not used to having such genial discussions about my kids—and especially, not with people who don’t know me well. I have spent so much of my time the past few years advocating for them in a cash-strapped school system and among neighbors who (with a few exceptions) didn’t have patience for anything outside the status quo. So I wasn’t expecting such a kind reception of my story. Add to that the fact that I didn’t have that many friends in Florida. Katie and I spent so much time with our kids, and that made it hard to meet new people. Plus, we lost a couple of friends due to our kids’ challenges, and these losses left me defensive, guarded, and cynical. I didn’t want to get to know anyone else. “Why bother?” I’d think. “It’ll only turn out bad.” I didn’t realize it until after having left Florida, but I had spent the better part of four years walking around with a cloud over my head and a chip on my shoulder. That seems to be changing now. 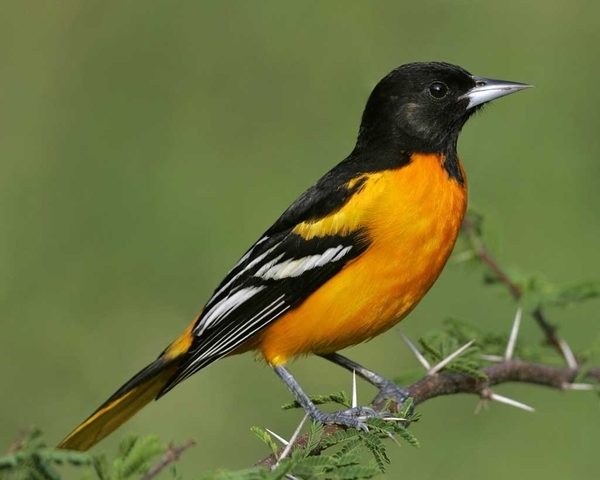 A couple of months ago, we moved back to Maryland, where Katie and I both are from. It’s something we had been wanting to do for quite a while, but never had the chance. We knew that Maryland schools were better, and most of our family is there. So when the opportunity finally arose for me to be transferred back to my company’s home office, we grabbed it—and we’re really glad we did. The school year hasn’t started yet, but all of our preliminary meetings have been extremely encouraging. Accommodations we could only dream of in Florida were offered to us without our even having to ask for them. Programs are in place here that we had never heard of down South—programs to help ASD kids not only survive but thrive. What’s more, and I don’t exactly know why, there seem to be a lot more families with ASD in our new hometown. Maybe it’s because of the higher population density. Maybe it’s because there are more doctors here who are trained to spot the signs of autism. Or maybe the parents are just better informed. Whatever the reason, that increase in numbers brings an increase in awareness and acceptance. So we’re feeling like we fit in here better than we did down there. It doesn’t feel as lonely. And then there’s family. All of my siblings are within an hour’s drive, and most of Katie’s siblings are even closer. Plus, Katie’s parents are just a ten-minute walk away. So there’s a lot more support where we are now, and our kids are surrounded by more than twenty cousins ranging from age three to twenty-six. All these factors have helped me relax a little bit. With increased awareness and acceptance, our kids have a better shot. With family around, we have ready-made friends and social situations. With a more accommodating school district, we hope to have fewer fights and less tension. A few days ago, I wrote that our family’s future is beginning to look brighter. Maybe I’m just fooling myself. Maybe we’re in a bit of a lull right now, a respite between crises. Or maybe with this fresh new start Katie and I are able to see our situation and our kids in a different light. Whatever the case, I’m enjoying it—almost as much as I enjoyed my conversation with those biblical scholars who reflected a God who loves and cares for his people. See that grainy picture right there? 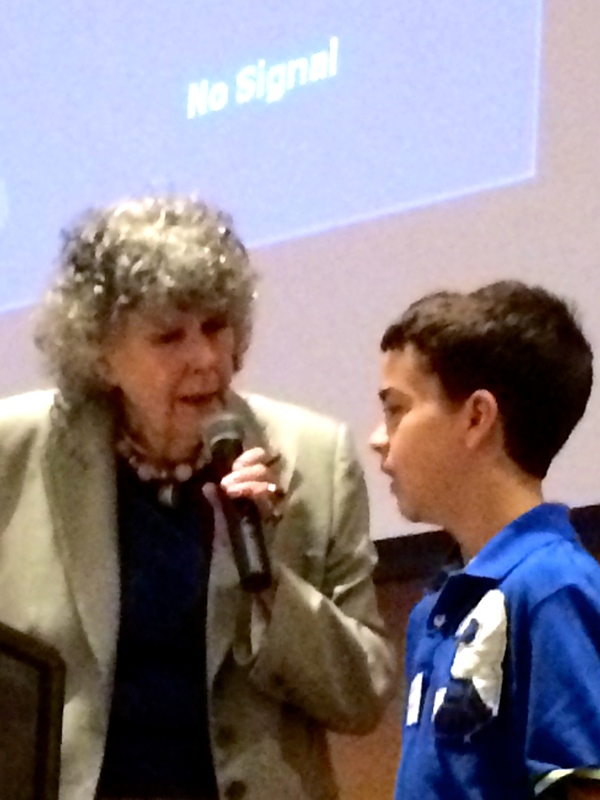 That’s my oldest son speaking with Eustacia Cutler, better known as Temple Grandin’s mother. Yes, that Temple Grandin. We were at a conference on autism on Friday, where Cutler and Grandin were both featured speakers. I wasn’t thinking of attending this conference—I had only heard remotely that it might be going on. But my son found out about it and practically begged me to take him. I was a little reticent. I thought it would be one of those highly scripted events, where the speakers on stage to rousing applause, give their spiels, and then are whisked off to some undisclosed location. 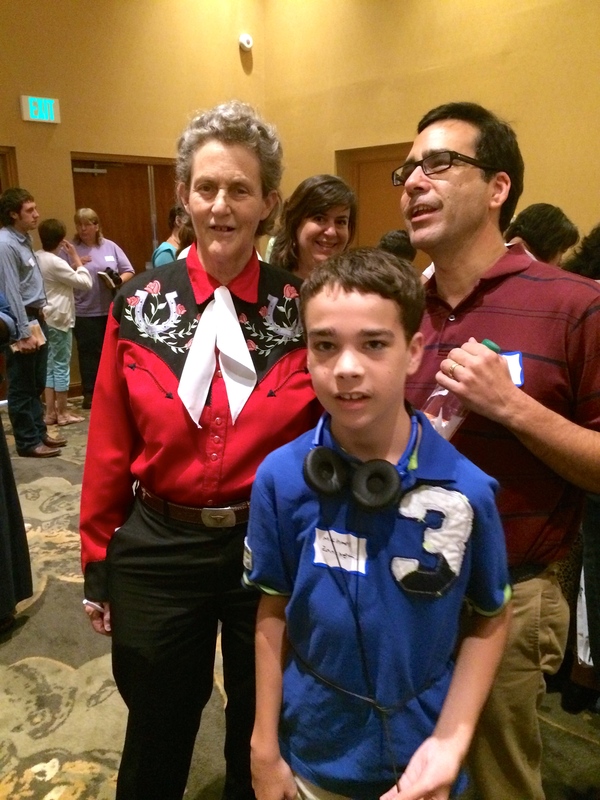 So I suspected that my boy’s dream of meeting Temple Grandin would probably not come true, and that he might end up disappointed. I was wrong. No sooner had we entered the lecture hall than we found Eustacia Cutler milling about, unrecognized by many of the attendees. So I took my boy up to meet her. She was as charming as could be, introducing herself to him and asking about him and his family. Very classy in the way that only New England matriarchs of a certain socioeconomic status can be. Then the moment was gone, and we had to find our seats. Michael was thrilled to have met her, if only so briefly. He also felt emboldened by it—and dramatically so. This kid, who is usually very shy and unnecessarily aware of his “otherness,” found the courage during the Q&A part of her talk to go up on stage and ask Cutler a question. Seriously. He walked right up in front of nearly three hundred people, spoke into the microphone, and his story. He talked about how he’s scared to make the transition from his very small private, Aspergers-only middle school (with a student body of 25) to the big, noisy, public high school where he is enrolled (population: 1,500). Cutler was impressed by his courage, and she told him to just be himself, remember his poise, and not to let anyone tell him he’s anything less than an amazing, goodhearted kid. Then everyone in the room gave him a big round of applause. I was floored. It was an awesome moment for me as a dad to see my son take this step. I spend so much time thinking about his social anxieties, his cognitive glitches, and his emotional ups and downs. I fret over his prickly relationships with his siblings. I worry about his struggle to handle sensory overload. But here he was, holding a conversation with Temple Grandin’s mother in a full-to-capacity conference hall! It got better from there. Temple Grandin herself came wandering through the hall during the second break, and I took Michael to meet her. Then, after lunch, he found her himself and spoke with her. Then again after her talk. Three different encounters with someone he admires so much. Three different topics of conversation. Not a fear in the world! My son did so well that I gave in and let him buy a (small) can of Red Bull, a drink he has long wanted to taste. I also bought him a copy of Grandin’s latest book. I didn’t really have a choice in that one. He had picked up a copy of the book to bring it to me and ask if we could buy it. On his way to find me, he bumped into Grandin one last time. She saw the book in his hand, assumed he had already bought it, and autographed it for him. What else could I do? A Glimpse of the Future. Anyway, we drove home at the end of the day, my son asleep next to me, as I excitedly filled Katie in on the day’s events. This is what I love about my kids. Every now and then, they throw me for a completely beautiful loop. Here I was worried about whether he would be able to make it through one talk, let alone four—and he goes and does this! We got home just in time for dinner, which was just as chaotic as it always is. For us, this meant a couple of tantrums and a minor melt down. Even my oldest, who acted so much like a young man during the day, collapsed halfway through. But that’s okay. I got a glimpse of the future, and it looked very bright indeed.